Postharvest regeneration of trees is essential. Preharvest planning can promote favorable conditions for seedling establishment or continued growth of advance regenera tion following harvest operations. On some sites or for some objectives, seedlings might be planted rather than naturally regenerated. This could be done to offset expected mortality on harsh sites, to increase the propor tion of a particular species, or to regulate spacing. Advances in seedling production and nursery operations are occurring around the world. In No Timber without Trees (Poore et al.) the authors concluded that fewer than 1% of tropical forests were being managed sustainably and that most were not being managed at all. 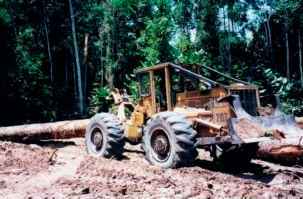 They argued that sustainable management of tropical forests for timber production is essential because tropical countries often lack the budget, political will, and logistical means to protect forests from colonization. Concession holders have a strong motivation to provide such protection to defend their investments. The Forest Stewardship Council (FSC), an agency based in Bonn, Germany, that fosters the certification of forests as sustainably managed, developed from this concept. To date, FSC certification has been achieved in many temperate forests, but only a relatively small area of tropical forests has been certified, especially in Africa. One timber company in Africa that has taken the long, but ultimately successful road toward FSC certification is CIB, the Societe Congolaise Industrielle des Bois, located in Pokola, Republic of Congo. CIB holds three large, contiguous timber concessions in the northern part of Congo near the country's borders with Cameroon and the Central African Republic. The concessions were granted to CIB by the Government of Congo for the purpose of managing the forest to produce timber, develop and operate manufacturing facilities, provide housing, schools, hospitals, and other amenities for workers and residents of the area (see Figure 10), and of course to provide revenues to the government through royalties paid on the timber harvested. CIB is a subsidiary of the Swiss based company tt Timber Group, which was acquired in 2006 by DLH Nordisk, a large manufacturer of tropical hardwood products based in Denmark. Most of the wood products from the CIB concessions are bound for Europe, a market that is particularly sensitive to the need for certified wood products. Thus, in 2001 CIB began evaluating options to have its forests certified as sustainably managed. The first step in the certification process was to establish and implement detailed policies on CIB's harvesting operations, which open up large areas of forest and can negatively impact residual trees, soil, water, wildlife, and other resources. This was regarded as an especially important step for CIB because the company's concessions border the Nouabale Ndoki National Park, an important reserve for lowland gorillas, forest elephants, and other wildlife. As a result, the company decided to formally adopt RIL on all of its operations. RIL comprises a set of technologies designed to reduce impacts associated with harvesting operations (see Figure 11). The most important of these technologies is comprehensive planning, based on a thorough preharvest inventory, to minimize disturbance to the forest while permitting access to trees that are available for commercial utilization.